Creating a resume can increase your confidence in your job search when you focus on the process instead of the end product. I am romantic about resumes and believe that resumes are the most important content piece and business document we can create. what does a modern resume look like? You could have the most perfect looking resume, and still not land a job. Your resume could be a featured sample in resume books and still not do its work. Now, that is confusing. The real work of the resume is using the creation and reflection process to help you figure out your skills and career direction. Once you have that, you can tidy it up in any format you like and it can start to work. The importance of a creating a resume is not perfection. 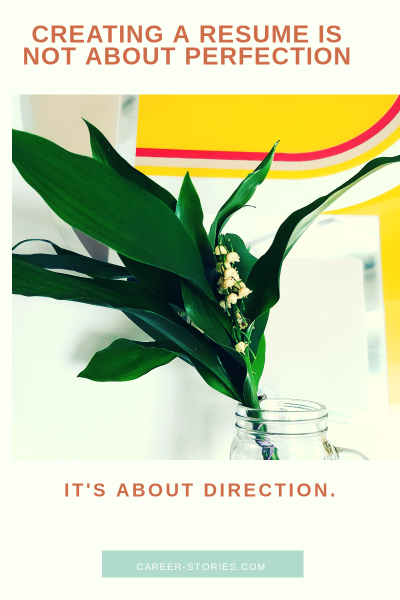 It’s direction. They have a nice looking resume, but they are no further ahead. Companies hire people, they don’t hire pieces of paper. A resume is a beautiful workhorse that gets people to call you, but you need to show up as you. You need to sell your skills, give solid examples of your work, know your worth, and where you are going. If you don’t do this work in advance, it is hard to fake or master during an interview. How does this increase my confidence? It increases your confidence, or the appearance of confidence because you now know the value and skills you bring to the table. You aren’t writing the resume trying to be perfect, or sound different, it sounds like you and your awesomeness. It sounds like someone who knows what they’re about and what they can do for others. That sounds like confidence to me. Want to write your own resume, but not sure where to start? I created an online course called Resume in a Weekend that walks you through step-by-step how to write a resume that sounds like you, highlights your skills, and hits the employers’ wants every time. If you want to stop googling resume advice, questioning yourself, and feeling poor because no one calls you for jobs you are qualified for, Get in the class. Yes, you can write a resume in a weekend. Then look at all those stories and identify which are your most favorite and stick those into your resume. You can turn them into accomplishment statements, here is a video to show you how. Hop into Resume in a Weekend and learn how to use those stories and a job ad to make a great resume every time.